Why Does My Child Have OCD? How Can I Help? OCD is hard on parents who are watching their child suffer and feel to blame or guilty when it's not their fault, although they can escalate the anxiety if they don't follow the recommendations. Obsessive Compulsive Disorder in children is not common, but when it strikes it's very disturbing. It usually appears in adolescence and adulthood. To spark it off in the young, the genetic tendency is probably there and then stressors trigger its appearance. Statistically it appears more often in boys, but it is certainly apparent in girls as well. OCD takes many forms. Each child is an anxious individual whose unwanted thoughts, images, and ideas spring forth in their mind unexpectedly and then preoccupy them. They develop compulsions or actions that serve to reduce the anxiety temporarily. Lara is a delightful child who is kind and empathic. But when she turns age 9, there are many stressors in her family. She worries about the health of her mother for example. She appears to cope outwardly, but inwardly she starts worrying about things she feels like saying that are on the hurtful side, quite contrary to her previous disposition. For example, she gets the idea of telling her slim mother that she's getting a bit of a belly. She feels this is mean and tries hard not to tell her. However, she can't contain her thought or her worry about it. Telling her mother who reassures her this is not of concern, relieves her temporarily. The obsessive thought is the idea about her mother's weight. The compulsion is to tell her mother and get the reassurance. This might happen 10 times a day keeping Lara generally anxious. Gerard, like Lara, is outwardly a normal child who does well in school and has many friends. The onset of his OCD is unclear except that it does run in his family. Perhaps the trigger is a special high-pressured academic program he began this year about which he is very perfectionistic. Anything less than 100 percent on tests and assignments sets him into a flurry. His parents are rather demanding knowing how unusually intelligent he is. While academically he can handle the work, emotionally he is drained. 1. Early on it is advisable to seek professional treatment. Although it's common to hope it's a stage or phase, it generally is not. This is not a disorder a child just grows out of. The symptoms of anxiety may escalate making the compulsions more severe without appropriate help from a mental health professional expert in OCD in children. 2. Be kind to your anxious child rather than think they can use discipline to will their thoughts away. This is a disease not an example of misbehavior. The child is communicating how anxiety ridden they are and they seek your reassurance to know their anxiety is indeed irrational and no harm will occur. 3. It's important to prevent your child from being ashamed of their mental state. Above all, they must know they are not bad, but distressed and you know that. 4. Empathizing with your anxious child relieves anxiety. Don't say to Lara, "Stop speaking like that to your mother!" Don't say, to Gerard, "I want to see all As from you. That's why you're in this program. You can do it." Instead, say to both of these kids, "It's hard to have those thoughts pressuring you. You can tell me about them and I will help you." OCD is hard on parents who are watching their child suffer and feel to blame or guilty when it's not their fault, although they can escalate the anxiety if they don't follow the recommendations. It's a genetic disorder that requires professional help not only for the child, but for the parents so they know how to support their child. Children who are supported by their parents recover more easily. 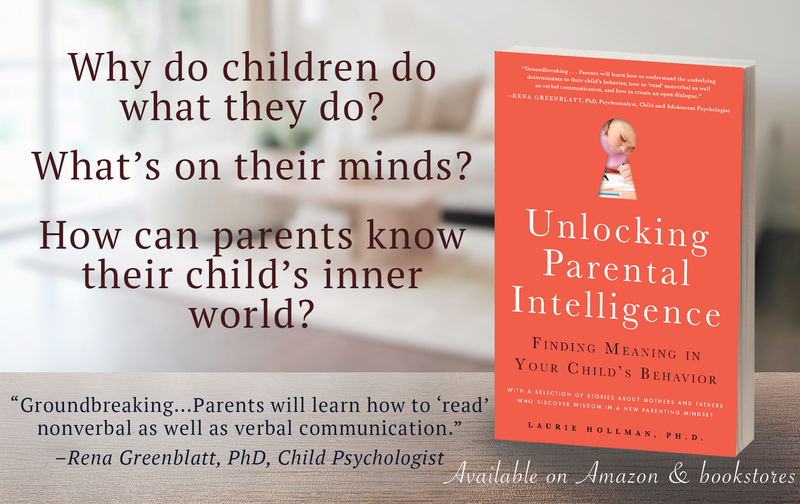 Laurie Hollman, Ph.D. is a psychoanalyst with a recent book with an outlook that can help parents with children with OCD, Unlocking Parental Intelligence: Finding Meaning in Your Child's Behavior, found on Amazon, Barnes & Noble, Familius and wherever books are sold. The book describes how parents can address behaviors by understanding they are meaningful and forms of communication. The five steps to Parental Intelligence give parents tools to help their child with OCD and other puzzling behaviors.